The current report is only available to members and paying customers. Past issues become freely available online when the next report is released. This report presents and analyses the basic features of foreign direct investment (FDI) in Central, East and Southeast Europe (CESEE) as reported in the balance of payments, following the directional principle and the international investment position. 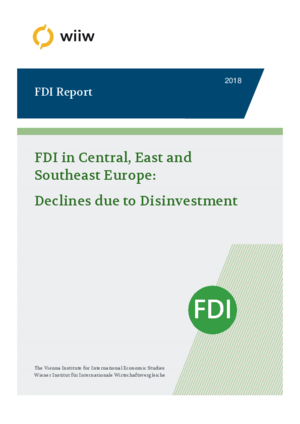 The data reveal that FDI in the region fell by as much as 25% in 2017 against the previous year, and by 20% in the new EU Member States (EU-CEE). These developments are not in line with buoyant economic growth. It was not that surprising, however, as FDI inflow data have been volatile and not much correlated with the rate of economic growth in individual economies. Part of this volatility is caused by disinvestment – i.e. capital withdrawals by foreign investors – which account for a significant component of (net) FDI inflows in the Czech Republic, Hungary and Poland, where national capital took over foreign subsidiaries in banking, utilities and communications, often with government support. In 2017, for the third year in a row, CESEE received increased greenfield FDI commitments in terms of the number of projects (7.4%), while the amount of capital investment pledged fell only 26% short of the extraordinarily high level of 2016 (data based on fdimarkets.com). In the EU‑CEE, greenfield investments rose both in terms of project numbers and capital investments. The biggest greenfield boom in 2017 was recorded in Poland, where FDI inflows reported in the balance of payments halved due to the domestic takeover of some assets, including a large bank. The strained labour market situation may hinder further FDI in the EU-CEE unless investors successfully cope with new challenges, such as immigrant workers, automation (which would trigger new investments) or moving further to the east (which might lead to a withdrawal of capital from existing locations). Relocation to the potentially promising neighbouring destination, Ukraine, is hampered by poor business conditions. New data allow us to identify the substantial gap between inward FDI stocks by the immediate investor (generally available information) and by the ultimate investing country (information available for five countries). These show that the Netherlands and Luxembourg are usually overrated as immediate investors; Germany and the USA turn out to be the most important ultimate investors. Austria remains the third most important investor in EU-CEE, but with declining shares in both home- and host-country reported stocks. Still, the FDI income gained from the region is high in international comparison, amounting to 1.1% of GDP or 10% of the outward FDI stock. The income earned by Austrian investors in EU-CEE is far larger than Austria’s net contribution to the EU budget (0.79% of its GDP). This online access with a modern query tool supports easy search and download of data. The wiiw FDI Database contains the full set of FDI data with time series starting form 1990 as far as available.